Interested in studying key community health issues in Costa Rica while developing advanced Spanish language skills? 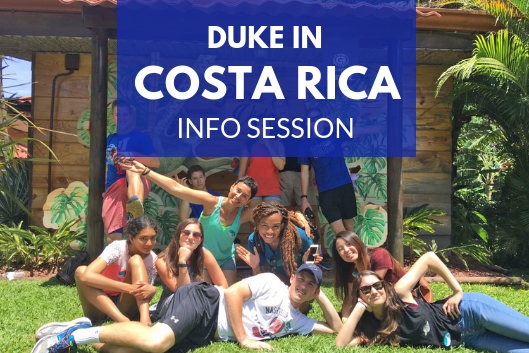 Come to the Duke in Costa Rica info session to meet program director Prof. Bethzaida Fernandez and get a preview of the guest speakers, site visits, and assignments for the program's signature course, Language, Culture, and Health in Costa Rica (SPANISH 306A / GLHLTH 326A)(CCI, FL 1.0 Credit). Get all your questions answered about the homestay experience and the exciting lineup of course-based excursions to places like Poás Volcano, La Paz waterfalls, and local indigenous communities!